Discounts are displayed in the booking panel on the right. Discounts and special offers are provided at the discretion of the tour operator/attraction and can be withdrawn at any time. To guarantee that you will benefit from the discounts that are currently available we recommend that you book now. Meal: Cold buffet lunch during cruise including roast beef, smoked gammon, ham and mortadella, steamed fresh fish, shrimp mayonnaise, salad bar with tuna, crab, a variety of salads and fresh fruit. FREE OPEN BAR during cruise serving beer, wine, soft drinks and mineral water. Meals included in a tour are normally set menus. If you have dietry requirements it is advisable that we are notified and you can do this during the booking process. A Fun and Exciting day out which will take you to both sister islands of Gozo and Comino. 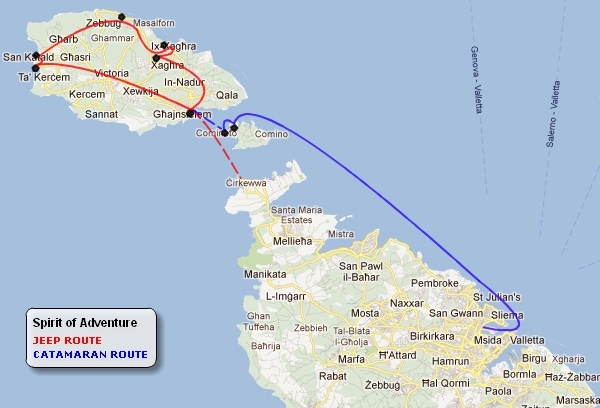 We start our tour with with a short ferry crossing to Gozo Island. Gozo is the greenest of the Maltese Islands, and you will notice this almost immediately when you arrive. The the beautiful landscape, stunning valleys amongst other unique characteristics makes Gozo the ideal location for touring by Jeep. Our tour features some of the popular sites including Calypso Cave, Dwejra Bay (Inland Sea, Fungus Rock & Blue Hole), you will dive on the salt pans and through the pretty quaint villages. At around lunch time we make our way down to Mgarr port where you will be picked up by catamaran. On board the Spirit of Malta catamaran you can help yourself to a lovely buffet lunch and open bar before we stop in one of the lagoons around Comino Island. Here you can swim, snorkle or just relax on the catamaran. As the day comes to an end the Spirit of Malta crew will prepare the catamaran for the return to cruise to mainland Malta. On arrival back at the harbour transport will return you to your hotel. During your visit to Comino Island and the Blue Lagoon, optional speedboat trips around the caves, coves and lagoons around the island of Comino are offered by local operators. These are available at a supplement and paid locally. Who should book this cruise? 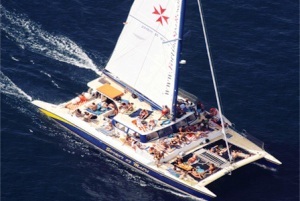 This tour does attract a younger type of clientele and parents with younger children should be aware that during the later part of the catamaran cruise, on the return back to mainland Malta party music is played and drinks are FREE flowing..! During May and October this tour includes half day Jeep tour combined with a boat trip. The type of boat may vary between a Catamaran or Gullet.